Horizontal split case fire pumps have historically been the most common type of fire pump used due to the wide range of available flow rates. Sizes range from 250-5000 GPM. As with all of our systems, every part of a Geo-Systems USA fire pump package is thoroughly engineered, reviewed, constructed and tested to ensure minimal field-installation or modifications. 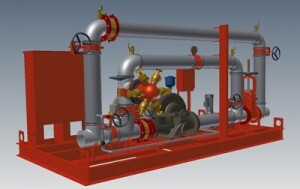 Whether the fire pump system requires a city water bypass, flow meter loop, fire department connection, a split-system due to accessibility restrictions of the final pump installation location or a multiple-pump system, we welcome the opportunity to custom-engineer your fire pump system. Our horizontal split case fire pump packages can be configured with any phase, voltage or controller starting method required. Whether it’s a low horsepower unit with a Limited Service controller or a high horsepower unit with UL/FM Variable Frequency Drive with Soft Start Bypass and UL/FM integral Automatic Transfer Switch, we can incorporate all of the fire pump system components into our sturdy packaged systems. 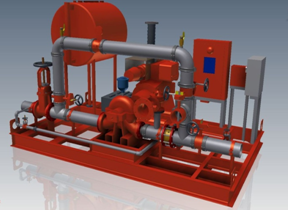 Our horizontal split case fire pump packages can also be designed with diesel engines, fuel tanks, battery racks and fuel management/filtration systems, regardless of the final installation location. Each diesel-driven unit is de-rated for final installation location (altitude and ambient temperature required) with Tier 1, 2, 3 and even 4i EPA emissions ratings. All fuel lines are stainless steel and our base, stands and supports are never minimized to ensure the utmost quality and integrity of your fire pump system.